On the 24th of March 2018, at Cape Town’s Newlands Stadium, the Australian cricketers were being run ragged by the hosts. Clueless against the resoluteness of Aiden Markram and the nonchalance of A B De Villiers, shoulders began to sag and heads to bend. The series was already on a knife edge, and not just metaphorically. With a tantalizing scorecard of 1-1, tensions ran riot as passion stepped over all unwritten thresholds of tolerance. David Warner, in one of the previous Tests had unabashedly and unashamedly justified his nickname of “The Bull” by first celebrating in a puerile fashion after running out A B De Villiers in a moment of magical brilliance, before making such reveling seem the stuff of Montessori kids by getting into an ugly verbal barrage with Quinton De Kock. But, in what seems to be a fate strictly reserved for the ides of March and not for the 24th, Cameron Bancroft at exactly 3.00 P.M resorted to an act that sent Australian cricket into a veritable tailspin. Cameron Bancroft, like a deer caught in the glare of a pair of powerful headlights, was caught by television cameras trying to rough up one side of the ball with sandpaper to make it swing. Acrimony, uproar, outrage, and investigations later, Captain Steve Smith and vice-captain David Warner were found to be involved and all three received unprecedented sanctions from Cricket Australia. 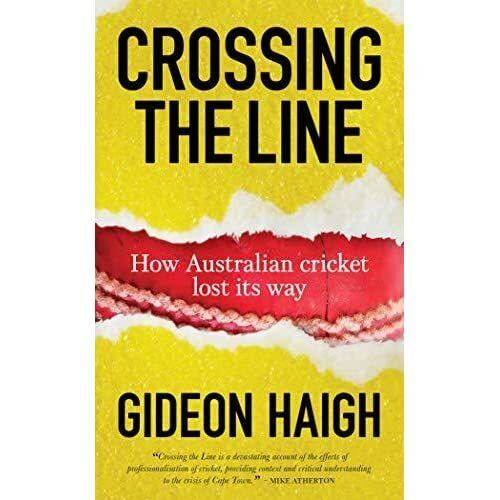 In the wake of this scandal, Gideon Haigh, arguably the greatest living cricket writer plying his wares today, in his new book “Crossing the Line”, proceeds to undertakes, what he terms his own ‘cultural review’, describing his outcome as “less official and far cheaper, but genuinely independent.” The book is the result of more than 50 interviews with people who have had a significant association with the game in myriad capacities. The interviewed include players, coaches and officials. However, no names are explicitly offered as the said interviews were conducted abiding to the conditions of confidentiality. The method adopted to groom and brood young cricketers at the domestic level also led to a shambolic strategy. The Argus Review of 2011 in the wake of the debacle at home ushered in a slew of changes that made the management phrase “top-heavy” read virtuous. Pat Howard came in as a high performance manager – a “sole point of accountability” for the national team’s results which led to the inception of a system that revolved around the national academy. The merits of ‘investing’ in ‘youth’ was blown out of all proportion courtesy, the ‘talent manager’ in the form of the egregious Greg Chappell. As Mr. Haigh illustrates, Chappell was a firm believer in the motto of catching them young and watching them grow. “Talent is like fruit,” he would say. “If you don’t pick it when it’s ripe, it’s likely to go off.” Cricket’s outstanding recent talents—Warne, Waugh, Ponting, McGrath, Brian Lara, Sachin Tendulkar—had all been blooded early at international level. The disappointments—Chappell spoke of “the Graeme Hick factor”—were those who had stagnated in first-class cricket, falling into bad habits. The exceptions—players such as Adam Gilchrist and Mike Hussey, who had broken through later—he deemed mistakes, players who “probably should have been picked earlier.” But this very policy of incubating the youth also in sheer contradistinction never batted an eyelid before sacrificing that very youth as was illustrated in the treatment of Cameron Bancroft. Made a scapegoat for the actions of his belligerent and bull-headed (no pun intended vice-captain), the 25-year-old was in the aftermath of Sandpaper Gate ‘thrown under the bus’. This brainchild resulted in the Futures League which bungled the careers of many talented yet ‘older’ players. Classic examples being Mark Cosgrove and Clint Mackay. In the Argus’ review “the words “accountable” or “accountability” would appear 43 times, and the phrase “high performance” 28 times, often in close proximity (“In high-performance organisations, measurement and accountability are a way of life and all leaders in the organisation must learn to link those measurements to high-performance outcomes”). Mr. Haigh also dwells on the infamous “Home-work gate which in 2013 scalped the then Australian Coach Mickey Arthur. The pitiful way to defend the sacking as measure to inculcate an ‘Australian way’ to play cricket signified a desperation rather than a dedication on the part of the functionaries of Cricket Australia. Crowning all these embarrassment (prior to Sandpaper Gate) was the clash between the Australian cricketers and the administration over player pay. The autocratic, derisive and high handed manner in which Cricket Australia approached the dispute left a lot to be desired. In “Crossing The Line”, which surprisingly is a very small book, Mr. Haigh does an admirable job of dissecting the frailties and foibles of a cricket administration operating upon the planks of rigidity and laxity. This he does with neither bias nor prejudice. I am not a cricket buff,like the whole country is. But since I don’t live under a rock, I have read about the sandpaper incident in the papers. 🙂 This is a nice post about the problems plaguing Australian cricket. Thanks a lot! Glad you liked it. Sandpaper Gate was seminal in so far as the fact that it transcended the sport into realms ethical and behavioural. Love to read the book someday. A great post. amazing read, i have never read something so elegant about the sport of cricket. will surely read your future posts. Thank you so much for your extraordinarily kind words!